Some random thoughts around the design and structure of some closely related Tarot decks, a little about the different artist's styles. Seeing the different approaches helps us to become familiar with how the symbols relate in different ways. Finding a deck that speaks to you but also works with and translates to different systems. *This is a more technical post for those who are interested in or are studying Tarot, (when I am doing a reading much of the technical side of things is only briefly mentioned). The following are some random thoughts on one of the most evocative cards in the Tarot deck. I am not putting forth the overall meaning of the card (it would be far too much to post here), but some of what the symbol inspires. 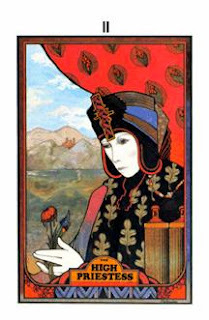 There's some very good resources, books, websites and courses to be found on learning Tarot. It's a lot like learning a language and the language changes over time. Even after more than 30 years I'm still learning, so here's some of my take on this lovely archetype. When people initially begin working with the Tarot this seems to be one of the cards that we feel a strong intuitive pull towards. Fitting really as it is the very aspect of our consciousness we are in the process of waking up or tuning into. Perhaps it has been calling us for some time and we are just learning to listen. I like the saying "What you are looking for, you are looking with". When you encounter something that strikes a chord within you or when you are learning something and at the same time feeling like you've known it all along, these are aspects of "Sophia" or a kind of higher spiritual knowing. This is the inner voice, the part of ourselves that only we can reach but also the inner sacred space through which spirit speaks to and through us. She is usually depicted and seen as a divine virgin, the part of consciousness that is above the ego and similar to another vision of the archetype the virgin Mary, she is the blessed wisdom that comes through Grace. She is also Isis, Persephone and a host of other icons. The black and white pillars beside her represent mildness and severity. In the Qabala these are means by which an adept can ascend or raise their consciousness, simply put through discipline and compassion, but she is herself a pillar by which awareness comes down the temple steps to meet us, she is the pillar of mercy. Working with the High Priestess archetype is partly about learning to listen to the inner voice. 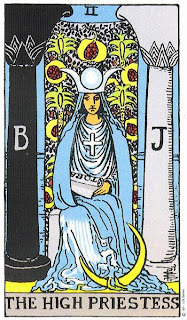 Her counterpart the Hierophant (or High Priest) is conscience, rules and discipline of morality. The necessary structures of faith and belief. She works as well alongside the Magician who draws associations and names things in the external world, she is the awakening wisdom that both inspires learning and leads us into further questioning. But she is that voice only we can hear, the Hermit card resonates with this as well as he is the translator that carries the message further out into the world, both a guide and an exile. We learn the cards not just in terms of their individual meanings but what they say in interaction with each other. Sometimes surrounding cards may suggest we need to heal or repair an aspect. Part of my posting about this card is a recognition to clean up the temple of my intuition a little. Clearing distractions to hear and see what Spirit is trying to say. 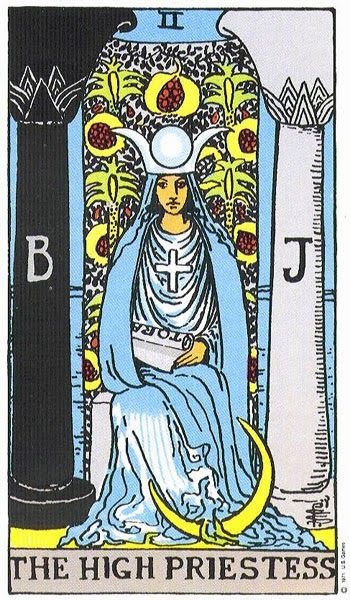 She is usually depicted holding a Tora or scroll of wisdom and more than one lunar reference appears on the card. 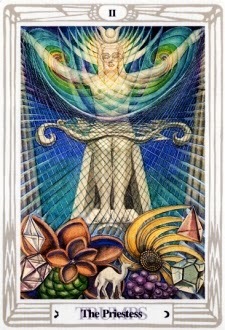 Like the moon card itself there is reference to the unconscious, the reflected light of the Sun or the waking mind. Her robe seems to become like a stream and it is, in fact the stream of consciousness. Crowley called her "The weaver of dreams" and we see that in the imagery of his deck. Much of our sense of self is transitory, we are as Edgar Allen Poe said "A dream within a dream". There are many artist's interpretation of this symbol, to really get a scope of what's out there and the varied imagery check out what comes up when you do a Google image search with "High Priestess Tarot". I generally work most with the Rider Tarot (the first pictured here) but I love different artist's interpretations. ﻿So in a reading this card can represent an important questioning, a mystery that leads us towards answers far beyond our questions. It is a hint of a greater learning going on beyond what we can see. I like to remember the lesson of the Fool that what we know or think we know shouldn't get in the way of what we are learning. To work with the Priestess, we have to lay aside (for the moment) opinion and analysis, to have the pure experience of now and the moment. I have just come back from a very good little vacation. I rarely take time off but following so many changes and the anniversary of last year's big move I was pleased to accept an invitation from my brother Dan and his wife Donna, to be away in the beautiful Interlake area of Manitoba, where they have a cozy little cottage. Working as an intuitive reader, it's important to sometimes pause and have periods for reflection and re-aligning. We did a lot of hiking, saw deer, eagles, pelicans (no bears this time) and other wildlife. Dan and I played cribbage in honor of my Dad (it was his favorite game) and reminisced about the times we had at the lake as children. We went up to Hecla Island, had lunch at the beautiful resort, stopped and bought Vineterta (an Icelandic dessert) and fresh Pickerel and Goldeye from the local fishermen.